"Tender egg-battered chicken breast pieces are deep-fried and served with a delectable lemony sauce." 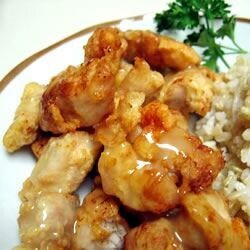 In a large bowl combine the chicken pieces, sherry, soy sauce and 1/2 teaspoon salt. Mix together, cover and refrigerate. Let marinate for 15 to 20 minutes. In a small bowl, whisk together 1/4 cup cornstarch and the baking powder; beat in eggs to form a batter. Coat chicken pieces with batter and set aside. In a wok, heat 2 cups oil to 350 degrees F (175 degrees C). Working in batches, fry chicken pieces in hot oil until browned. Transfer to paper towel-lined plate. In a medium bowl combine the sugar, 1 tablespoon cornstarch, broth, lemon juice and 1 teaspoon salt. Mix together and add lemon slices. Heat 2 tablespoons oil in small saucepan and slowly stir in lemon sauce mixture. Cook, stirring, until sauce is clear. Pour sauce over chicken and serve.